Since the inception of Supply Chain Matters, we have amplified numerous occurrences of significant industry supply chain disruption brought on by natural disaster. Just about two weeks ago, we noted the approach of Hurricane Harvey, which has turned out to be a 500-year milestone storm delivering massive flooding to the Texas and Louisiana coastline regions. The transportation, logistics and industry impacts in the aftermath of Harvey are still unfolding. As we pen this commentary on Thursday evening, September 7, another significant and record-breaking cyclone has the potential to add further disruption to industry supply chain and transportation networks. A State of Emergency has been declared for the entire state of Florida and mandatory evacuations of residents are in-effect for the Florida Keys and Miami Beach regions. The sheer size of Irma is such that it exceeds the width of all of Florida. Thus, authorities have been very stern in their warning messages that residents be prepared for the worst. Irma is forecasted to impact Florida sometime late Saturday or early Sunday and possibly make its way up the Southeastern region of the U.S. All is dependent on where thi storm makes its turn toward the northeast. nland areas, depending on its eventual track. 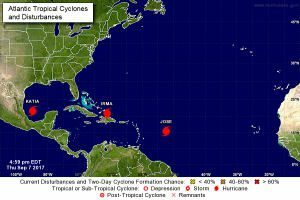 Hurricane Katia is further churning in the Gulf of Mexico and threatening to impact Mexico coastal areas. Noted in our last update on the effects of Hurricane Harvey, transportation to the impacted Texas coast regions is just starting to recover, with lots of trucking capacity being marshalled for additional storm related aid. With the pending strike and sheer size of Irma, Federal disaster agencies have already scrambled hundreds of trucks to move emergency supplies of food, water, and fuel to the Florida region. Interstate 95 and the Florida Turnpike that spans the length of the state are packed with crawling traffic, mostly moving away from the southernmost portions. Once again, many industry supply chain, procurement, and product management teams will continue with frequent communications with suppliers, contract manufacturers and transportation services providers within the impacted regions. 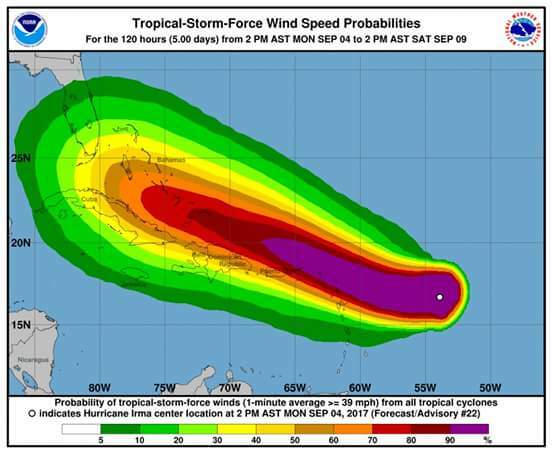 Within the potential path of Irma could be the Ports of Miami and Fort Lauderdale, hubs for Latin American sourced goods as well as a healthy volume of cruise ship terminals. If Irma were to continue up the Eastern seaboard, disruption concerns would be raised for the Ports of Charleston and Savannah, major hubs supporting the U.S. Southeast manufacturing region. Let us all hope for the best outcomes both for human life and in potential destruction. Many business continuity and disaster support centers are already stepping into action mode, preparation for the worst and trusting in the best possible outcomes. Supply Chain Matters will publish our latest weekly update on Harvey’s impact sometime tomorrow. We must add an overnight development to our above blog commentary regarding ongoing potential disruptions to industry supply chains. A powerful 8.1 magnitude earthquake struck portions of Mexico’s southern Pacific region overnight with the effects of the quake felt and experienced in Mexico City. The U.S. Geological Survey indicates that the epicenter was 103 miles west of Tapachula in southern Chiapas state. At least 20 aftershocks of upwards of 4.0 magnitude have subsequently occurred and government agencies are still in the process of rescue efforts along with assessment of damage to housing, businesses, and general infrastructure across the impacting Mexican states. Meanwhile, the head of the U.S. Federal Emergency Management Agency (FEMA) indicated that U.S. agencies are now preparing a massive response to potential effects of Hurricane Irma this weekend. His exact statement: “Hurricane Irma continues to be a threat that is going to devastate the United States in either Florida or some of the southeastern states.” He further warned that parts of Florida may experience electrical power disruption for days if not longer. More than 100,000 residents or tourists may require shelter. Events surrounding the U.S. and Mexico are obviously going to get rather serious over the coming days.